We're still in Dallas. Northwest Airlines will probably need to carefully balance the plane when we board tomorrow due to the copious amount of great food we've eaten the last two days. (Translation: Kelly happy.) And man, is it green here! It's like we've fast-forwarded four weeks. The grass is growing, the trees have unfurled new, yellow-green leaves, and Natalie has already picked me two bouquets of "yellow flowers." It's cloudy and stormy today -- which equals humidity. Our hotel room's sickly AC can't banish that "someone-is-smothering-me-with-a-pillow" feeling. So we're off to our friends' house to play with their kids -- which is where we've been most of the last few days. As my daughter said yesterday as we drove along TX 114, "Mom, I like Texas." I'm getting so excited I can hardly stand it. So may I share with you? I haven't been to Texas since 1980, when Dallas was synonymous with J.R. and shiny glass buildings. Thanks to Tammy -- who is a native Texan -- and her gentle twang, I can say "y'all" and even "all y'all" without embarrassing myself. But what else do I need to know to enjoy my four days in the Lone Star State? Are there local customs I should know about -- or avoid? What is the appropriate attire for March in Texas (besides maroon)? Will I be allowed through security if I don't carry a gun? And most importantly -- where should I eat?!? I love my daughter. 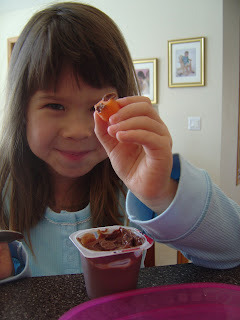 And for the record -- she loves carrots on their own and eats them by the bushels. (We should really pee orange in our house. We eat that many carrots.) But this particular day, she apparently decided to mix things up. I don't know how this happened, exactly. I'm a nice Midwestern girl who grew up in the suburbs. No one in my family hunts pigs (or any other animal, for that matter). I've only been to a rodeo once. I've never eaten at Sonic. I've never had interesting neighbors. (Unless you count the dreadlocked hippie who grew vegetables in her front yard. But that's not that weird. 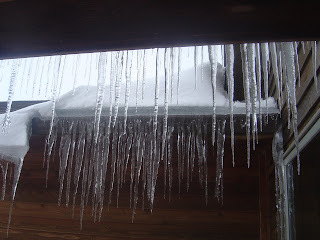 Not in California.) I have never -- and I mean never -- watched a college football game from start to finish. I don't even know what A&M stands for. But somehow, I've fallen into a whole slew of blogs written by Texans -- and I'm loving it. Maybe it's because I grew up eating grits slathered with butter and drinking sweet tea. Or maybe it's because I say "y'all" at least once a day. (I even sling an "all y'all" every once in a while, thanks to my Texas-born-and-raised friend Tammy.) Or maybe it's because I understand this one very important thing about Texans -- they love their football. They are fanatical about it. It's more than a pastime; it's a passion. And right there, we have something in common. For while I like football -- my husband played; ergo, I'm a fan -- I'm downright nuts about the sport of my home state, which is hockey. I love everything about the game -- the slightly sweaty smell of the rink, the crisp sounds of the blades on the ice, the creak of the boards when a player lands a well-placed check. I especially love the game in its purest form -- which is to say, when it's not a boxing match on ice. And where can a hockey fan revel in the competitive grace that is hockey at its finest? Why, at the Minnesota State Boys' High School Hockey Tournament, of course, which wraps up today. It's a contest, an institution and a love-fest, all wrapped up in one glorious weekend. My favorite part? It's not about fighting -- at least, not gratuitous fighting. It's about skating -- skating fast and with flair. And shooting the puck using skill and teamwork. It's about sportsmanship and decade-old rivalries and the sheer love of the game. Teams that come from small, Canadian-border towns like Warroad and Roseau travel to St. Paul to compete against high schools that have more students than their entire town population -- and they usually win. Many of these boys learned to skate as soon as they learned to walk, and they've spent many a cold winter day playing hockey in backyard rinks until their toes were numb. So why am I writing this ode to hockey? Well, it's about all I can do, seeing as I live "outstate" right now, and I can't watch any of the tournament on TV. (It's broadcast live in the Twin Cities.) I can only sit at my computer and wait for updates on the Web -- which, as you can imagine, is about as exciting as watching paint dry. Thus, I've decided to channel my frustration into positive energy -- you sensed that, right? -- and do something constructive. And now, I'm off to pop some popcorn and grab another handful of Dark Raisinets. The final game is 7:00 PM tonight. I'll need stamina to hit reload 358 times. 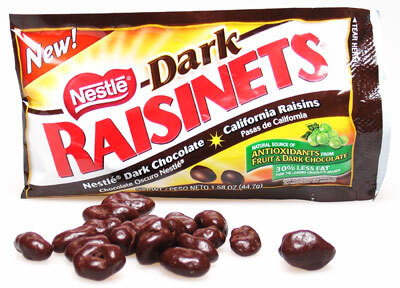 I stumbled across a new food item at "the Wal-Mart" yesterday: Nestle's Dark Raisinets. Wow. Double-wow. Wow. Wow. Wow. I can't stop eating these little nuggets of goodness. The chocolate is dark enough to make them rich, and the raisins are plump and tart and chewy. Plus, they are "a natural source of antioxidants." It says that right on the bag. I realize there are two kinds of people in this world: those who love chocolate-covered raisins, and those who think they look and taste like small turds left by rabbits. Obviously, I'm in the first camp. If you are in the second, I feel sorry for you. Really. And I'm happy for me. Because now I can have the Raisinets bag all to myself. 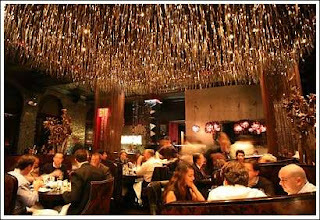 Welcome to my little corner of the Ultimate Blog Party. Seeing as I'm guest #669, I'm not sure how many people will make it here. I mean, I'm waayyyy down the receiving line - past the mother of the bride, past the bridesmaids, past the grandparents, past the second cousin-in-laws. But if you happen to stop by via the party, I'm happy to have you. 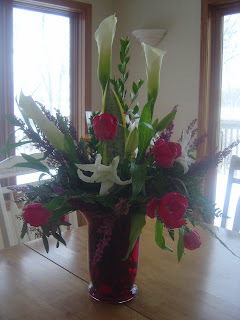 Many of the blogs I've read this fine Monday morning have the theme of spring. "Spring is just around the corner," they say. "I had to run the AC this weekend for the first time." It's made me more than a tad jealous, seeing as spring is most definitely NOT around the corner for me. (See post below for proof.) Our high today is 20. 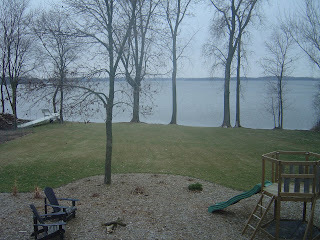 I doubt we'll see the ground again -- much less something green resembling fresh grass -- until the beginning of April. 1. A bowl of Cracklin' Oat Bran topped with ice cold milk and perfectly ripe red strawberries. 2. The sound of birds singing in the trees outside my window. 3. My kids playing and laughing together. 4. Chicken Salsa Chili with all the toppings. 5. An uninterrupted time of Bible study and prayer. 6. Canoeing in The Boundary Waters Canoe Area. 7. Going out for coffee with my husband. 8. Stephen Curtis Chapman on the radio. 10. People who make me laugh and people who laugh with me. 11. "The Chronicles of Narnia." 12. A long, hot shower. Uninterrupted. 13. The sounds and smells of Del Mar Beach. 14. Any breakfast at Hash House A Go-Go, but preferably the mango-coconut flapjacks. 16. When my husband brings me flowers. 17. A fresh tomato out of my garden. 19. Sun sparkles on water. Ahhhh. I feel better already. So how about you? What are a few of your favorite things? We're going to get out and enjoy some serious playtime today. 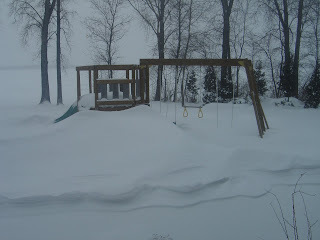 How could we not with six-foot drifts stacked up like mini-mountain ranges in the backyard? 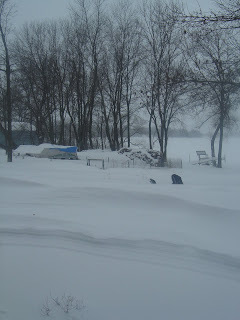 Of course, I feel slightly sad when I see my prized Adirondack chairs buried in snow this deep. No wonder their paint is peeling.